Clothespin and Maksutov on shaky mount. Thread: Clothespin and Maksutov on shaky mount. This must have been around the same time as I saw it the first time. May be even this amateur had read it over here! Smooth fine focussing with a Maksutov on a shaky mount seemed virtually impossible. The simple clothespin is a very good solution. 1. Fine focussing becomes very smooth and precise. I have tested that and came to the conclusion that in focus without the little pin was not the exact focus. With it it could be done much easier and smoothly. 2. Shaky mount means no way to judge if you are in exact focus. By using just your fingertip pushing the clothespin, most tremors stay away. And yes...it is a ridiculous sight. But since I am mostly alone out there in the dark, nobody will notice. j.gardavsky, jaetea, Makuser and 8 others like this. Re: Clothespin and Maksutov on shaky mount. Hi John. I have since re-inherited my old SkyWatcher C90 Mak, when my son moved to Michigan in 2017 and left it here. I want to use this telescope for nature photography now. But your tip should also work on my Orion 180 Mak for lunar/planetary work, where fat fingers have a problem fumbling with the large primary mirror positioning knob. Thanks for this fine tuning tip John, and the best of regards. 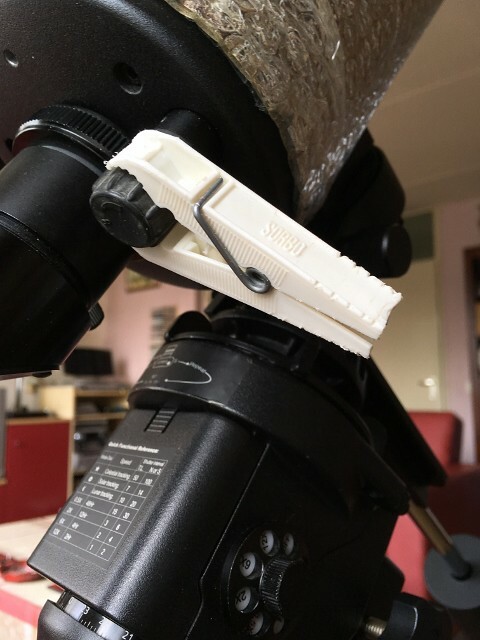 I think this is a much more elegant solution than some of the guidance we have previously given which was to cut out the center of an old round plastic lid and slide it onto the focuser knob. Giving you a much bigger knob to turn thereby giving you finer control over your focus. Accessory Supply! In case you are interested that is Item#39569 on the HF website. It is the 1" Steel Spring Mini-Clamp. Hi all. Here is one more. I just checked with the wife, an JT is right about only the wooden clothes pins that don't open wide enough are still available. BUT, she also told me that you can always get the plastic potato chips/popcorn/or other snack bag clip sealers. They are cheap, light weight, and open far enough to accommodate the large Mak focusing knob. BTW, the HF clip is only $0.99, so even my CFO would approve it. Makuser, kingclinton, John Baars and 1 others like this. Makuser and John Baars like this.